The National Weather Service can now give better, faster and more pinpointed severe weather forecasts because of new computer simulations. The weather service on Tuesday started using a new high resolution computer model that officials say will dramatically improve forecasts for storms up to 15 hours in advance. They say the more detailed resolution and more frequent updates will save lives with better warning for tornadoes, thunderstorms and blizzards. 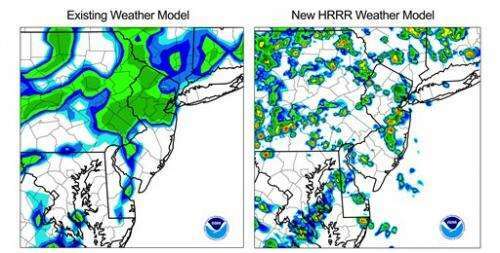 Meteorologist Geoffrey Manikin (MAN'-ih-kihn) says the old forecasts would have shown, for example, green blobs for storms over northern New Jersey. The new forecast will pinpoint small orange circles over specifics areas. The in-advance forecasts will look more similar to radar images. Officials said two new supercomputers and five years of research make it possible for the upgrade in forecasts.